Eruption of Mount St. Helens on July 22, 1980. List of active volcanoes includes volcanoes which are erupting, or have erupted in modern times. Many volcanos have erupted dozens of times in the past few thousand years, but are not erupting at this moment. Some scientists consider a volcano active if it has erupted in the holocene (historic times) period. Most volcanoes live many thousands of years and erupt many times. However, most don't erupt even once in a human lifespan. Signs of unrest such as unusual earthquake activity or significant new gas emissions are signs that a volcano is active. 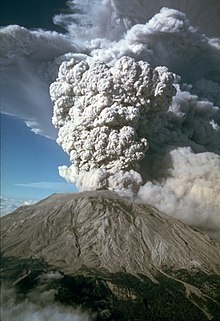 An example of an active volcano is Mount St. Helens in the United States (US). There are more than 1,500 volcanoes that could be active today. An estimated 500 million people live near active volcanoes. Planet Venus has more volcanos than Earth. Some may be active. There are active volcanoes in every part of the world. There are about 1,500 active volcanoes, many in the region of the Pacific Ocean. The Pacific "Ring of Fire" is an arc around the Pacific Ocean where there are 400+ volcanoes. Other regions of active volcanoes include the Mediterranean Sea, the Atlantic Ocean and other places. ↑ The plural of volcano can be either volcanos or volcanoes. Both are equally correct, and it is not a matter of British vs US spelling. Oxford English Dictionary. Spelling on any particular Simple page tries to be consistent. ↑ 3.0 3.1 Ball, Jessica. "Voices: Dead or alive ... or neither? Why a dormant volcano is not a dead one," Earth Magazine (American Geosciences Institute). September 8, 2010. Retrieved 2012-6-14. ↑ Rosenberg, Matt. "Pacific Ring of Fire," About.com. Retrieved 2012-6-15. ↑ Global Volcanism Program, Smithsonian Institution. ↑ UNESCO, "Heard and McDonald Islands"; Australian government, "Heard Island and McDonald Islands, Landforms". Retrieved 2012-6-15. ↑ McGuire, Bill. "In the shadow of the volcano," The Guardian,October 15, 2003. Retrieved 2012-6-15. ↑ GVP, "Erebus". Retrieved 2012-6-15. ↑ "'Ladies and gentlemen, on your left you will see an erupting volcano': The stunning sight Caribbean holidaymakers saw from plane," Daily Mail (UK). April 1, 2010. Retrieved 2012-6-14. This page was last changed on 19 April 2019, at 21:44.